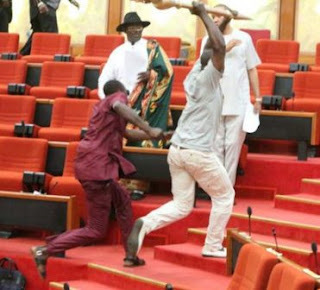 There were at least 250 security men on duty at the National Assembly yesterday when five unknown persons barged into a senate session, picked up the mace and escaped with it, sources said. Multiple sources including senior security officers and staff last night confirmed that there are over 500 security men attached to National Assembly and that half the number is on duty on working days. They are made up the policemen, agents of the Department of State Service (DSS) and sergeant – at- arms staff. Findings revealed that there are over 100 policemen attached to the National Assembly police division, 300 Sergeant -at- arms (NASS local security), about 50 official of the Nigeria Security and Civil Defence Corps (NSCDC) and almost same number of operatives of the DSS. The five thugs arrived at the main entrance of the National Assembly in a black Range Rover SUV and reportedly told the security that they were together with Senator Ovie Omo-Agege (APC, Delta) who was entering the premises at the same time. Oma-Agege who was suspended last Thursday arrived the Senate chamber around 11.15am, same time when the five unknown intruders moved into the complex. Since his suspension, Oma-Agege had not attended the plenary session until yesterday. He was suspended over his remark that the amendment to the sequence of elections was targeted at President Muhamamdu Buhari. While Omo-Agege went straight to his seat at the chamber, the thugs walked for about 30 metres through the aisle to the table where the mace was kept. 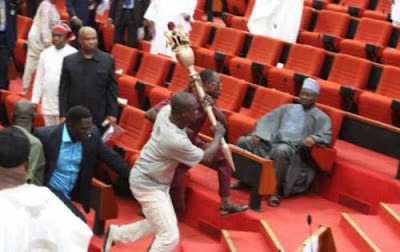 One of them seized the mace and turned back with the others in tow, while the Deputy Senate President, Ike Ekweremadu, who was presiding over the plenary session, watched aghast. There were attempts to stop them but they forced their way through the main entry point and jumped into a waiting black SUV and zoomed off. Attempt by two Sergeants-at-arms to stop them was unsuccessful. After the confusion subsided the senators went into a closed door session where the issue was discussed. Sources at the closed session told Daily Trust that the senators weighed two options. “We had the option to either adjourn sitting or continue without the mace. It was at this point that I placed my waist belt on the table. The debate continued but later the Sergeant -at-arms intimated us that there is a spare mace,” Senator Shehu Sani (APC, Kaduna) said. At 12.07pm, the closed session ended and the senators resumed plenary session. They continued with legislative activities lined up on the order paper.